It’s probably been about 20 years since I last timed myself running 100 metres. From memory, it was under 15 seconds (possibly 13 or maybe 14 seconds). I suspect I could run it a bit quicker today, as I run several times a week these days, somewhat more regularly than I when I was a kid. No matter how fast I can run, it seems unlikely (ok, let’s just assume impossible), that I could outpace Usain Bolt over the same distance. If I were to race him at the Olympic 100 metres final, a thought experiment which admittedly requires a significant feat of imagination, he would be well ahead of me at the finish line. You could argue, there would be essentially no point in me turning up to such a race. However, not every situation is an Olympic race. Sometimes, not being the fastest is still a winning situation. Let’s take for example the case, when you run to catch a bus. If you run fast enough (even if not as fast as Usain Bolt), you are more likely to catch the bus, than if you walk. Those extra few seconds running, can save you an additional 10 minutes waiting for another bus. This of course assumes that you know where the closest bus stop is. If you do not know where the closest bus stop is, you’ll need to spend a few minutes searching on Google Maps. Let’s say I know where the bus stop is, but someone running fast than me doesn’t know. It seems likely that I’ll still end up catching the bus, but they won’t. In essence, in this situation is not purely about speed, but also about the information you have. The same is also true in trading. At a recent conference which I went to, there was a presentation by Pierce Crosby (@CrosbyVentures) from StockTwits on An era of emerging data. In the presentation, Pierce gave an interesting quotation about trading which can be summarised by the following, it is not about how fast, it is about having the best information when you arrive for a trade. Trying to be the first person to place a trade after for example, an economic data release number is released is extremely difficult. It becomes technological arms race, rather than a race between traders, with fast connectivity and data processing trumping everything else, whilst the trading strategy itself might be relatively simple (buy USD/JPY if US data is better than expected, sell otherwise). If you are second in the queue, the price will already have moved significantly and there would be much less alpha left in the strategy. This is the nature of high frequency trading, and it is becoming increasingly expensive to get quicker and quicker. So rather than trying to spend millions and millions of dollars on technology infrastructure to be there first in the queue, just as with our bus stop example and in the spirit of the quotation above, we can seek to use better information, and use that to make our trading decision. That is one of the major ideas behind my new company Cuemacro, as well as doing quant consultancy work, helping clients to create systematic trading strategies and “Pythonising” their analysis of financial markets, we are also focusing on creating data indices to help clients better understand the economy. We use both common and unusual datasets to create innovative indices to have a better understanding of the macroeconomic environment. Over the past few years, in this search for exciting datasets, I’ve looked all manner of interesting data, ranging from news data, to central bank communications, to sell side trade recommendations and so on (somewhat truncating this list!). In my own trading, I have never attempted to be the quickest, because it would be simply too expensive for me to create the infrastructure. Instead, my models trade at a lower intraday frequency, where my signals are based on understanding the underlying behaviour of currency markets, rather than trying to be “first”. Over the past 3 years, trading on my personal account, I’ve generated a Sharpe ratio of over 2, which has strengthened my belief that it is possible to trade successfully without necessarily being the fastest. Each dataset can give you a different snapshot on the market and combining them together can help create a full picture. Having a thorough understanding of the economic picture, is crucial for traders in macro markets and also for businesses whose operations are affected by the broader economy. The objective is to generate these estimates quickly and in a much more timely fashion than official economic data is disseminated. If we take for example GDP, it is many months before a final number is released, reducing its value to market participants. 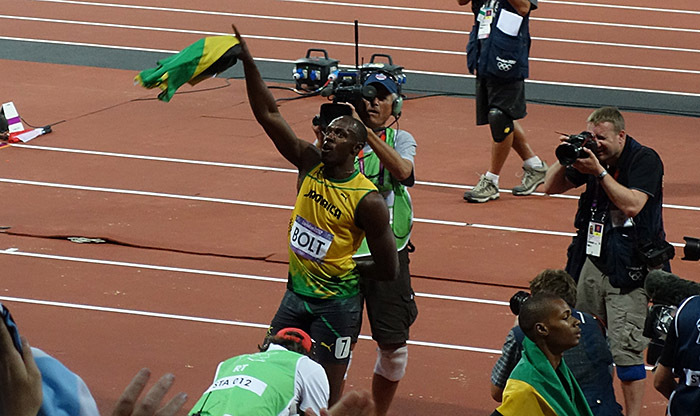 We may not all be Usain Bolt, but when the destination is unknown, we might beat him to that finish line, with better information. If you’re interested in hearing more about Cuemacro’s pioneering work in this area let me know, or indeed if you have a unique dataset that you would like me to take a look at!